Audible, the leading provider of audiobooks with over 180,000 titles. Get your free audiobook at audible.com/twist. Jason’s pick of the week is The Hobbit, written by J. R. R. Tolkien & narrated by: Rob Inglis. 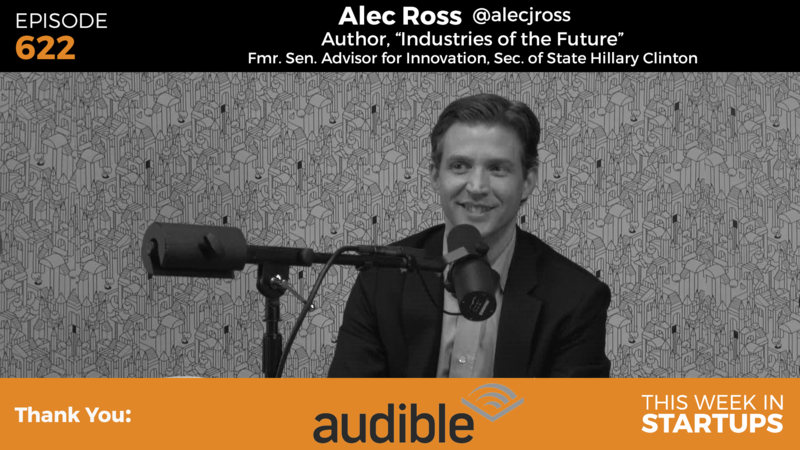 In episode 622 of This Week in Startups, Jason sits down with Alec Ross, author of The Industries of the Future to discuss technology, employment, and the future of the United States economy (as well as the world). Their conversation ranges from Alec’s experiences working as Senior Advisor for Innovation for Hillary Clinton during her tenure as Secretary of State to how unemployment rates in the U.S. differ from elsewhere, from robots and technology replacing (some) jobs in the future to Alec’s three greatest global fears — and much more. Check out some of the main talking points below to spark your curiosity for the full episode. Jason and Alec spend the first part of their conversation discussing Alec’s tenure working with Hillary Clinton. They both share personal insights into Clinton’s character and her desire to understand and empower innovation in the future of the U.S. Despite her commitment to knowledge and technology, one of the most salient stories told was about her understanding the importance of family and life outside work. Alec tells how she would often leave the office to work from home, so that her team could go home to spend time with their families. But probably not for the jobs you think. While robots and automation have consistently moved in to replace manual, repetitive tasks, Alec spends time exploring how the rise of AI and cognitive machines means that robots will also be able to do semi-cognitive, semi-routine tasks that have previously been done by humans. This isn’t for the worst: historically, he says, being replaced by a machine has almost always resulted in a shift in the working force toward more efficient uses for human time. Alec spends some time discussing how massive wealth inequality is a problem, but it has also resulted in the quality of life improving for almost everyone over time. While massive wealth has been accumulated by some, many of these people have turned around and given back — either through private philanthropy, research, or by affecting policy change on a global scale, such as the fight against AIDS in Africa. Immigration is One of the Biggest Problems in the U.S.
Immigration is a problem, but not only for the reason you’d imagine. Unfortunately, the “xenophobic” attitude in the U.S. is not only preventing illegal immigrants from coming to the United States — it’s also preventing talented entrepreneurs from doing business and increasing the power and wealth of the country. Jason and Alec discuss policy changes necessary to change this, and why it’s vital that the U.S. change its approach to immigrants from the past few decades, or risk losing a seat among the most powerful, innovative countries in the world. Alec has his reasons for saying so right at the front of mind. There are real threats to the United States and our way of life (as well as the safety of the globe and global economy): Vladimir Putin with access to nuclear weapons, the hatred that Pakistan has toward the U.S., and the ability for ISIS to orchestrate an(other) event that results in a high body count in a Western capital. At the same time, there are also exciting opportunities on the horizon. The Industries of the Future that Alec explores in his book will change our world dramatically in the next century; as long as we’re savvy enough to deal with the threats and encourage innovation along the way. Want to hear the whole conversation? The full episode with Alec Ross, as well as past episodes are all available on This Week in Startups. 0:45 – 7:04: Jason introduces Alec, and they discuss his time working for Hillary Clinton during her tenure as Secretary of State, and why you shouldn’t go home before your boss. 7:05 – 9:03: Alec and Jason discuss the email scandal around Hillary Clinton, and their thoughts on the issue, as well as Alec’s work during the Benghazi attack. 9:09 – 11:14: Jason and Alec discuss the future of the publishing industry and the power of Audible. 16:35 – 17:48: Alec gives opinions on the current state of the election campaigns, and which parties are at play. 19:51 – 22:43: Alec explores the future of robotics in replacing jobs, and what areas we can expect to see this happen in. 22:43 – 27:45: Jason asks Alec about the polarization of wealth, and whether he thinks it is a problem. 27:45 – 29:27: Alec expands upon the way that the polarization of wealth is solving global problems such as the AIDS epidemic. 29:28 – 32:30: Jason and Alec discuss how extremely wealthy individuals and philanthropy affect public policy, using Hillary Clinton and Barack Obama as examples. 32:30 – 35:50: Alec and Jason turn the conversation toward immigration, innovation, and how the US needs the former to stay on top of the latter. They also discuss how most of the issues we face related to these issues boil down to racism. 35:51 – 38:55: Jason and Alec discuss Donald Trump, his narcissistic tendencies, and his election chances. 38:55 – 44:23: Alec shares his fears about the economy and industries of the future and how some technologies are enabling these. 44:23 – 48:34: Jason and Alec discuss how ISIS uses social media and psychology to recruit and empower their movement, and what the U.S. can do in response. 48:34 – 51:33: The conversation turns to oil and energy; Alec and Jason discuss how prices have gotten so low, and the impact on the global/U.S. economy. 51:33 – 53:14: Jason asks Alec about Vladimir Putin and his role in oil/resource management in Russia. 53:15 – 55:29: Jason asks Alec what he thinks will be the biggest industry to change the future. His answer? The commercialization of genomics.